System Integrations are critical to delivering information to and from the platform, which we don't take lightly (or outsource!). Our integrations team builds campus integrations in-house to deliver a rich, native experience with real-time information transfer. Everyone hates logging in multiple times across multiple websites, so why would we expect students to do it? Single Sign-On (SSO) ensures that students are able to log in once with their federated school credentials to securely access all relevant content. Student Information System (SIS) data are critical to delivering a personalized app experience based on student demographics, among various other uses. We work with the best of the bunch. Students expect to be able to participate in group discussions and get course updates on their device in real time, so we've made sure they don't miss a beat with their campus app. 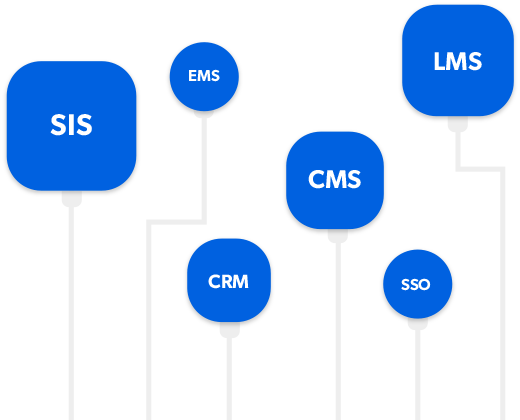 We integrate with all the major Learning Management Systems (LMS).